International Maritime Associates and World Energy Reports have joined forces to provide the most sophisticated and in-depth Floating Production Systems reports, market outlook, analysis, daily intelligence and interactive database. Co-founder of World Energy Reports and spearheading the business intelligence gathering is managing director and founder of International Maritime Associates (IMA), Jim McCaul. Jim has more than 30 years experience in the global maritime and offshore oil/gas industries, producing 50 multi-client industry reports on the floating production sector over the past 18 years. 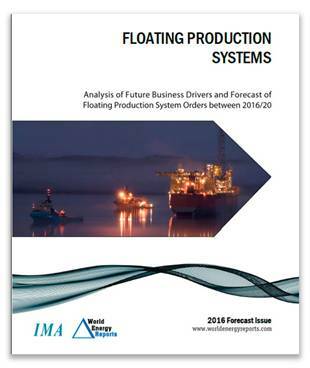 IMA’s “floater reports” have been a major source of market intelligence in the offshore industry and the IMA annual forecast of equipment orders has been widely referenced in investment presentations, industry publications and other consulting firm reports. Jim has provided extensive market analysis and strategic planning to many of the world’s major field operators and offshore contractors. 2019 EDITION NOW AVAILABLE, ORDER TODAY! 90 pages of analysis, data, charts and forecasts, all geared to provide the biggest, best and most comprehensive resource so that you can long-range plan to capture your share of the $100+ billion floating production system market over the next five years. This report presents our five year forecast of floating production system orders. First we present an overview of the industry and our assessment of the underlying market situation likely to prevail over the 2019/23 forecast period. Then we provide our forecast of orders for eight types of production systems under three market scenarios. The final four sections of the report contain details for floating production systems in the planning stage, on order, in operation and available for redeployment. Preview the report! See the 2019 forecast outline and list of exhibits on pages 4 and 5. Our monthly reports provide a detailed snapshot of the business sector as of the middle of each month. More than 90 pages of data and industry analysis each month. Excel spreadsheets with each report enable subscribers to tailor the data presentation to their needs. In October of each year we provide a detailed five year forecast of production floater orders. In March of each year we fine tune the forecast and make revisions as needed. The online database is updated every day – with information direct from primary sources. In the database are details for 230+ planned projects, 395+ installations in service, 45+ floaters on order and 30+ floaters available. The database is fully searchable. Customized charts and spreadsheets can be directly produced from the database. Our market Intelligence comes with a complete customer support package. Jim McCaul and International Maritime Associates are available to assist with technical questions about information in the database and reports. Our technical support staff is able to assist with any questions about using the online database, search tools or features. WHY SHOULD I PURCHASE A MARKET INTELLIGENCE PACKAGE? The forecasts and market intelligence packages are utilized by top business planners and investment analysts in the market. Every day, representatives from banks and financial institutions, oil & gas companies, government agencies, equipment manufacturers, ship and offshore rig builders, construction agencies, and owners/operators access the market intelligence and forecasts they need for sound investment decisions. 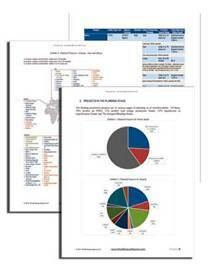 The WER/IMA monthly reports provide more than 90 pages of data and industry analysis, presenting a detailed snapshot of the business sector as of the middle of each month. Excel spreadsheets with each report enable you to tailor the data presentation to your needs. In October of each year we provide a detailed five year forecast of production floater orders. In March of each year we fine tune the forecast and make revisions as needed. The online database is updated every day – with information direct from primary sources. In the database are details for 230+ planned projects, 395+ installations in service, 45+ floaters on order and 30+ floaters available. The database is fully searchable. Personalized charts and spreadsheets can be directly produced from the database. We offer full support to subscribers. We will assist with questions about information in the database and reports – and our IT manager will assist with any questions about using the database search tools.